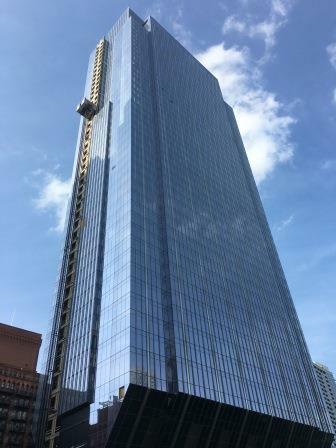 There are many things that come to mind when thinking about Chicago: the Willis (formerly Sears) Tower, the Chicago Bulls, Lake Michigan… Soon you will be able to add 150 N Riverside to the list, a new building constructed using 2,530 tonnes of ASTM A913 Grades 65 and 70 column sections. ArcelorMittal is the only producer of the ASTM A913 specification, a material that is used by ArcelorMittal Europe ̶ Long Products’ Differdange mill in Luxembourg to produce steel sections. 150 N Riverside, which has been commissioned by Riverside Investment & Development, is a 54-storey office building with approximately 111,000 m² of rentable space. The building is designed by the architectural firm Goettsch Partners, with Magnusson Klemencic Associates serving as structural engineer of record. It is located on one of the most prominent sites in the city:the south branch of the Chicago River. 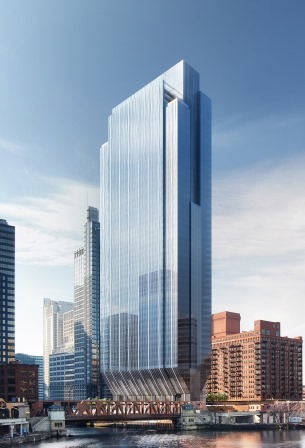 The signature component of 150 N Riverside is the way the building appears to stand on one foot. With its vertical exterior columns seemingly terminating at level 8, the building has a significantly smaller base when compared to the typical floors above. This special layout was required to accommodate the complexities of the building site. 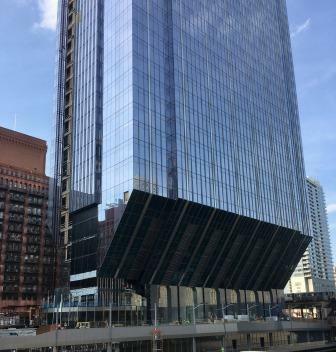 The project is located just metres away from the Chicago River at its east and a rail yard that has been active for more than a century at its west. The constraint of the railway, which made it impossible for the building’s exterior columns to extend to solid ground, pushed the design team to develop what is known as a core-supported framing plan. In the core-supported plan, the building was essentially designed as a typical office building from level 8 through level 54 with an efficient, yet complex, transfer truss system that enables the weight of the building to be supported on its concrete core below level 8. The core is then supported on a 3 m deep concrete mat that transfers the load to a collection of 16 rock-socketed caissons below, each one having a 3 m diameter. The structural engineer, in cooperation with Zalk Josephs, the project’s fabricator, determined that incorporating 70 ksi steel sections into the design would lead to considerable savings in fabrication hours and cost. Prior to the material being specified on this project, A913 Grade 70 rolled shapes had been used on only two projects (both in Canada), so 150 N Riverside became the world’s third project and the first in the United States to feature 70 ksi rolled shapes. ArcelorMittal International’s North America sales team worked closely with ArcelorMittal Europe ̶ Long Products to provide the fabricator with sections in A913 Grades 65 and 70. The project not only incorporates these one-of-a-kind specifications, but its design also uses some of the world’s largest structural shapes: W36x925 and W14x873 sections. Like the ASTM A913 specification, these are uniquely produced by ArcelorMittal Europe ̶ Long Products’ Differdange mill. Incorporation of A913 Grade 70 material into the perimeter columns enabled the use of 65 ksi rolled shapes at the base of the structure. This resulted in significant savings of fabrication and erection costs and a total tonnage reduction of 550 tonnes. Overall, for 150 N Riverside the total savings in the weight of the structural frame was 6%. When comparing the savings to the columns, where the high-yield A913 steels were most commonly employed, the weight savings was 18%. In addition to the weight savings, the fabricator noted benefits from the avoidance of preheat requirements when welding A913 Grade 65 material. In particular, 150 N Riverside features cantilevered framing elements composed of thick sections for which it was necessary to connect them together by welding completely across their cross sections (this is known as a Complete Joint Penetration (CJP) weld). ASTM A913 Grade 65 steel is approved by the American Welding Society to be connected via welding without having to heat the section before commencing the process. This characteristic is unique to this grade, and the major benefit of it is that the fabricators can save a lot of time and energy in its processes. Lastly, the use of the high strength steel and larger section sizes eliminated virtually all coverplating requirements for the columns. Again, a major benefit to the fabrication of the project, removing the need to coverplate columns saves a significant amount of labour hours and cost on projects. Erection of steel at 150 N Riverside started in May 2015 and the project is already receiving a lot of attention. The time for it to really shine, however, will be in January 2017, when the project will be completed.